Oh, how I’d missed sleeper trains! I slept pretty well underneath the thick blanket provided and, other than the bizarre switching on of all the lights in the early hours of the morning, the journey was very smooth. The last hour in particular is very scenic and the train had mostly emptied out so I was able to jump down from my bed and bag a window seat as we pulled into Zhangjiajie. There’s not much of note in the city itself so to get to the main attraction – the iconic forest park – you have to hop on a bus. I had opted to stay in Wulingyuan which is a small town to the southeast of the park, just a few minutes walk from the entrance. There are a lot of hostels and hotels here. To get there from the city, you need to grab a minibus. 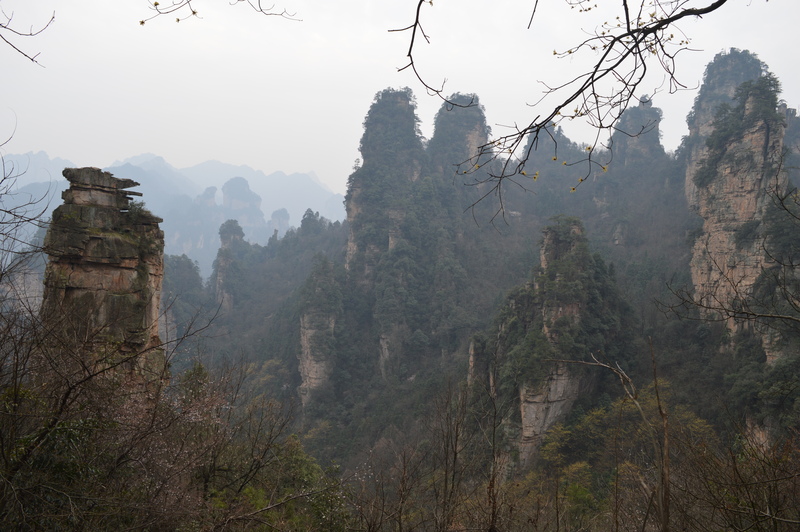 From Zhangjiajie station (Google Maps says there are two but it’s only the more central one which is actually used I think), head to the left and you should see McDonalds. The big building attached to it is the central bus station. Walk inside and head out to the buses, then keep going left until you see a whole host of minibuses. I just kept saying ‘Wulingyuan’ and was soon pointed to the correct one. The fare is 12 yuan and the journey should take about 40 minutes. The town isn’t very big so you can easily walk around to get to either your accommodation or the park entrance. I stayed in Destination Youth Hostel just off Jundi Lu which was fantastic. For around £4 a night you get one of the nicest dorm rooms I’ve stayed in and they provide a free map of the park. It’s quiet and the owner is friendly though speaks limited English. For a basic, ‘no-frills’ stay, it’s ideal. Obviously, the big attraction here is the national park. The inspiration for the film Avatar, this park is HUGE. From the Wulingyuan entrance, you have to take a (free) 20 minute shuttle bus just to get to the beginning of the sightseeing. Planning your time wisely is key. Fortunately, your ticket lasts for 3 days (with fingerprint verification to stop you passing it on). If you’re a student of any university, make sure you take your ID as you get a significant reduction (160 yuan instead 245). 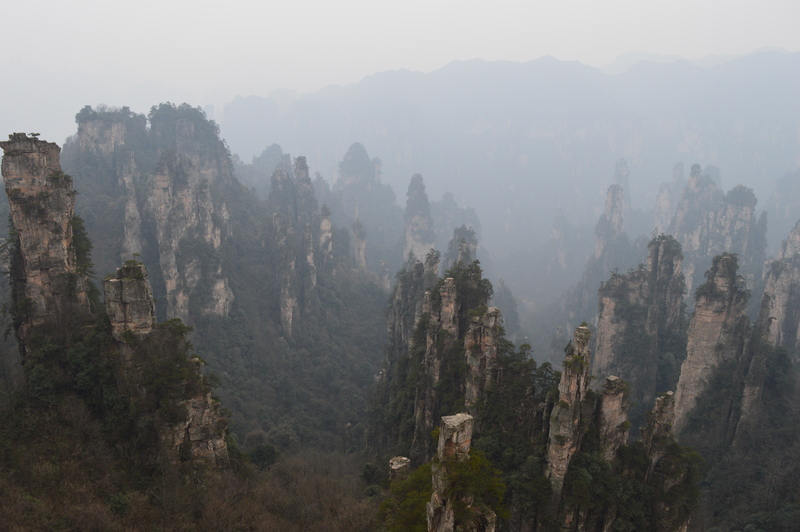 It was quite overwhelming stepping in on my first day but I decided to hike up to Tianzi Mountain. There are people at the entrance’s bus station who can direct you as to where to tell the driver to get off. 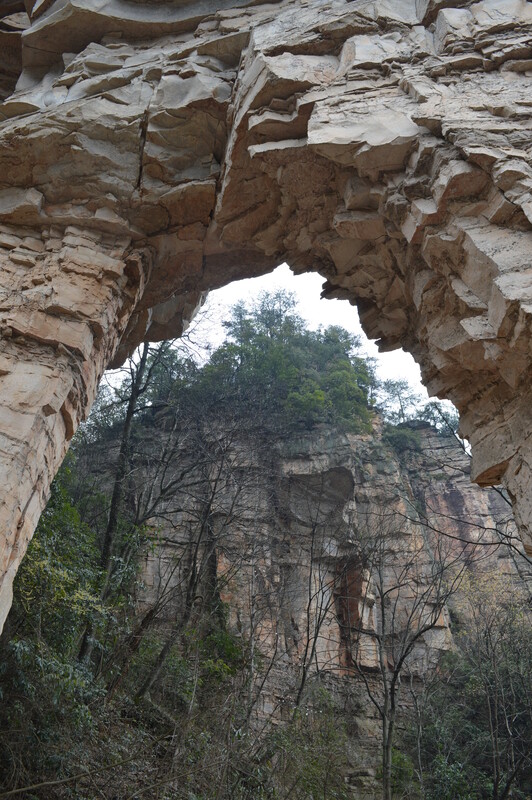 The hike to Tianzi Mountain is one of the first stops, though the driver will only stop if you tell them. You can also take the cable car (for a fee) up and down the mountain, though this had been closed for some time when I was there (though nobody thought to tell me which became a problem later on!). The hike up was fantastic though and mostly deserted. At one point, I stopped and heard silence. Complete silence. I honestly can’t remember the last time I heard absolutely nothing. All the while, you have the park’s iconic peaks looming over you, making for some stunning scenery. It’s a looooooong climb though and very tiring. I lost count of how many stairs there were though apparently it’s around 8000. You soon find it’s worth it when you reach McDonalds Helong Park at the top. Helong was a general apparently and his park houses some truly stunning views of the towering peaks. My camera has never clicked so much. The signposts are a little hit and miss in certain areas so it’s best just to wander round seeking out the best views. The whole hike up there took me around 3 hours and I’d seriously recommend it. It’s one of the best I’ve ever done. Around now things could have gone very, very wrong. As I’d started late, it was now early evening and I intended to get the cable car back down to the bus station then head to Wulingyuan. However, the signs pointing to the cable car neglected to tell me it had shut down so I walked all the way down only to be told that it wasn’t in use and the only way down was to hike all the way back. There were buses going to other areas of the park which were still just about running (I think the buses finish around 6pm) but my only option then would have been to get the giant elevator down and I wasn’t sure I’d get there before closing. Unsure what to do and with the top levels now mostly deserted, I went over to two Chinese hikers and asked for some advice. The two Chinese tourists from Wuhan had been debating the same issue and were also heading to Wulingyuan. With hiking back down being the only option, we set off, stopping at a few new sightseeing points along the way. It still wasn’t ideal with it getting dark, but at least I now had company. The two students were great fun too. Their English was very limited but they were eager to learn and, in turn, helped me practise my Mandarin. With the help of Google Translate, we got by alright. They also got competitive, trying to outdo one another with their knowledge of English! It was now getting dark and we eventually picked up a few other late night hikers, forming a bigger group of resilient hikers walking through the darkness. It was a bit eerie but I was very glad of the company! Luckily, someone in the other group was a tour guide so was also able to arrange an after-hours bus to pick us all up at the end. I now firmly believe that travelling solely hinges on pure luck. I also shared a truly delicious meal with my new friends before they headed home the next day. Particularly amusing was teaching them ‘Cheers!’ when drinking our bottles of beer. After showing them what we do in England, they both thought we had to clink our glasses before every drink, meaning drinking our bottles took quite a bit of time. I started the day on a sleeper train and ended up sharing delicious food with some locals. Today definitely summed up the life of a traveller!